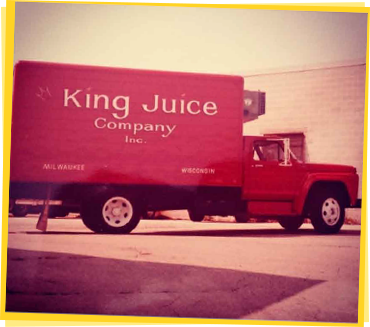 The original, and now famous, Calypso Lemonade recipe was created in 1985 in Milwaukee, Wisconsin, by the owner of the King Juice Company Inc. The idea was simple – make an authentic, delicious lemonade made with real lemons and real sugar. We made the lemonade in small batches and delivered it locally on the company truck. Through the years, our Original Lemonade grew in popularity. Bolstered by the response to our lemonade recipe, and inspired by the fruits, flavors and spirit of the islands, our Original Lemonade was given the name Calypso in 2000 and grew into four lemonade blends. Fast forward to 2018; the islands inspiration was brought to life even more with new watercolor graphics and island foliage. Over a dozen lemonade, limeade, and tea and lemonade combinations are now available – all based on our Original Lemonade recipe. Each Calypso flavor is made with a focus on quality, using real lemon or lime bits, real sugar and natural flavors. From our family to yours – enjoy a Taste of the Islands and Be Your Island Self!